The dorsal margin is convex and the ventral margin is concave. Valves are strongly arched, more so in larger specimens. For most of the length of the valve, the margins are similar in shape and equally spaced from one another. The apices are rounded, protracted and dorsally recurved. The helictoglossae are located close to the apices. The distal raphe ends curve onto the valve face, extending a little less than halfway to the dorsal margin and then curving back slightly toward the center of the valve face. Striae are evenly spaced, and parallel along the length of the valve, becoming radiate at the apices. Areolae are 40 in 10 µm. One apical rimoportula is present, just dorsal of the midway point on the valve apex. 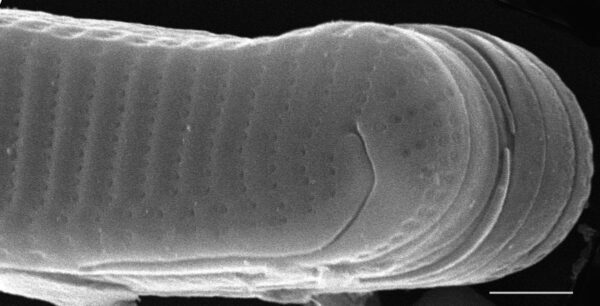 The external expression of the rimoportula is similarly placed (see SEM image). The internal expression of the areolae are round and areolae aligned at almost the same level as the inner valve surface. Historically, there has been taxonomic confusion between E. steineckei Peterson and E. nymanniana. Eunotia steineckei is considered to be a subjective synonym of E. nymanniana (see discussions in Furey et al. 2011, Lange-Bertalot et al. 2011, and Mayama 1997). The original description of E. nymanniana includes two diagrams (Grunow 1881, Figs 34: 8,10). 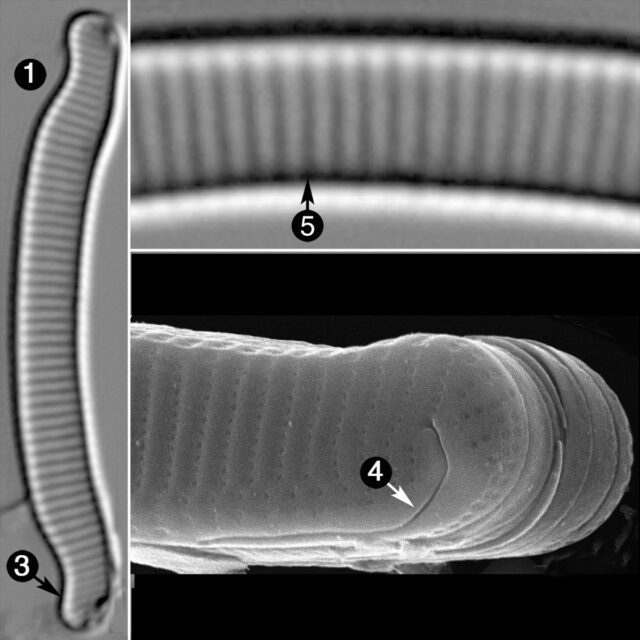 The image on the left (Fig 34: 8) was lectotypified by Mayama (1997) and the image on the right is conspecific with E. neocompacta Mayama in Mayama & Kawashima (1998). Found in streams and wet walls, often associated with bryophytes. 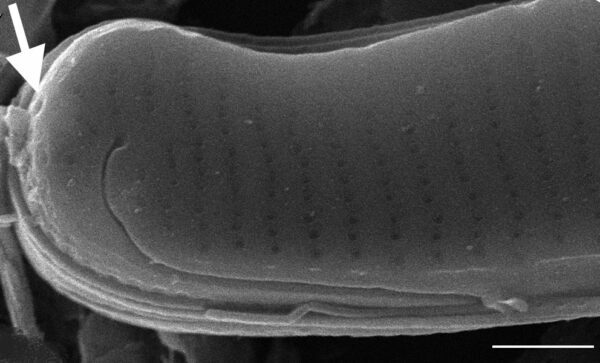 Mayama, S. (1997) Eunotia nymanniana Grunow and related taxa Diatom, 13: 31-37. Mayama, S. and Kawashima, A. (1998) New combinations for some taxa of Navicula and Stauroneis, and avowed substitute for a taxon of Eunotia Diatom 14: 69-71.